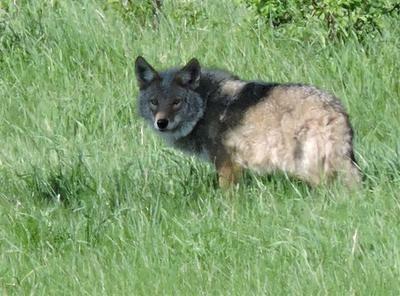 Here's a photo of a Wolf taken by my sister recently. She said it was in one of their fields; their property backs on to a conservation area and Sturgeon Lake, near Lindsay. When we visited them at the end of May, we could hear wolves howling at night! Thank you very much for sending this picture! I'm sure our readers will enjoy seeing this as much as I did. What a gorgeous animal, but everyone is right, it's a coywolf. Would just love to give him a great undercoat brushing and then some revolution ehy >?? haha .. Yes, it is a Coy Wolf, they are breeding regularly and quite often now. Increasing in population these Coy Wolves. I have also seen one in Northumberland County, Ontario. 100% definite it is not a Wolf. It has a totally typical Coyote face. That is a Coyote, not a Wolf. The interesting thing here is that only female Coyotes breed with a Wolf, never a male Coyote with a Wolf, I think for obvious reasons. Definitely a hybrid, it has a Coyote snout. Wow, what a beautiful animal. Thanks for posting the picture. Your sister is very lucky to be able to seem them. Wolves and Coyotes are inbreeding and the result is what you see here. Notice the characteristic Coyote face, sharp nose and ruffed neck. They look like Coyotes, but are much bigger and unlike Coyotes, that are quite solitary, they run in packs. ice picture!